Highland House Ski Shop and Rentals has been providing quality winter sports rentals at affordable prices since 1977! Winter sports activities have changed...as has the equipment in the last 33 years. One thing that hasn't changed is our commitment to offering you the best and newest in ski and snowboard equipment! We offer the latest and best in or ski and snowboard rentals. We also have a great selection of skiwear, snowboard wear and accessories...all at reasonable prices. We offer 10% discounts on multi-day rentals. Highland House also offers convenient reservations and group rates for parties of 10 or more. With our fast, friendly staff...you'll find a one-stop shop to get in and out on the slopes and ready for a great day of winter fun! Highland House is a family-owned and operated business...and with over 23 years of experience, we can make your ski and snowboard rental a hassle-free part of your trip to the ski slopes! 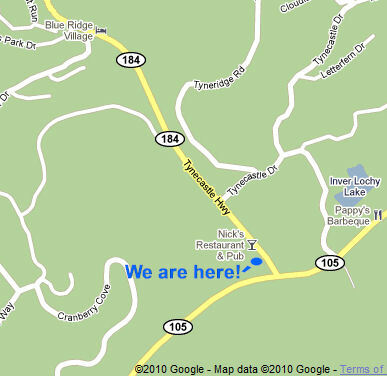 Our location right on the corner of Hwy 105 and Hwy 184 (Tynecastle Hwy) is literally one-half mile from the entrance to Sugar Mountain and on the way to Beech Mountain Ski Resort. We offer the best rates around on clothing, accessories and rentals! Stop in and see us or call 1-828-898-6690 if you have questions or if you're with a group and we'll have everything ready when you get here! Highland House Ski Shop offers the latest equipment in ski & snowboard rentals. We have a great selection of skiwear, snowboard wear and accessories at reasonable prices. We offer discounts on multi-day rentals. We offer reservations and group rates for parties of 10 or more. Highland House is conveniently located right on the corner of Hwys 105 & 184 (across from the Tynecastle Shoppes) and within minutes of Sugar and Beech Mountain Ski Resort!